A foto que você está vendo, foi do meu aniversário de 23 anos organizado pela Paula Gama no Mo Gun. Enquanto corto o meu bolo com uma fatia maior que o necessário, Si Fu observa ao fundo rindo. The photo you see was my 23rd birthday organized by Paula Gama at Mo Gun. While I cut my cake with a larger share than necessary, Si Fu is in the background laughing. Oito anos depois a mesma cena se repete de forma espontânea , na qual Pedro Freire(foto), o aniversariante da vez, corta o bolo com uma fatia maior que o necessário observado por mim que também acho graça. Aquele momento me lembrou a Paula e de todas as vezes que ela fez o mesmo por mim. 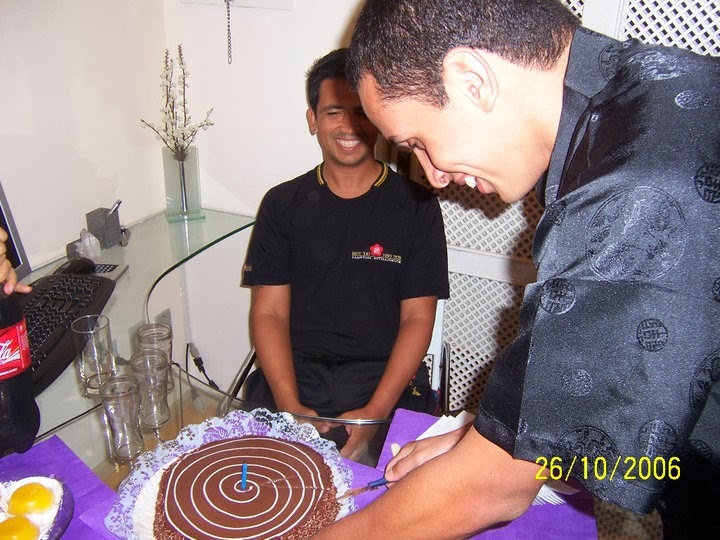 Eight years later the same scene repeats itself spontaneously, in which Pedro Freire (photo), the birthday of the time, cuts the cake with a larger than necessary slice watched by me like Si Fu did 8 years ago. That moment reminded me of Paula and every time she did the same for me. André Almeida, Alexandre Ribeiro, Fabiano Granado e Claudia Leivas estavam presentes quando cantamos "parabéns" pelo décimo sétimo aniversário de Pedro Freire no Mo Gun do Méier. Todo mundo um dia já pensou em parar de praticar Ving Tsun. Eu pensei várias vezes. Em algumas delas , eu chegava a comunicar ao Si Fu pessoalmente : "Estou me afastando", mas lá estava eu no dia seguinte sendo recebido aos risos por Si Fu perguntando: "Ué? Voltou?"... e eu respondendo: "é..."
Everyone has thought about one day stop practicing Ving Tsun. I thought several times. In some of them, I came to inform the Si Fu personally: "I'm out" but I was there the next day to be greeted by laughter Si Fu asking, "What? You Returned" ... and I answered: "Yeah ...looks like that "
Rodrigo Caputo (Longhaired) seems to have a very strong bond with Pedro Freire (photo), the birthday boy. 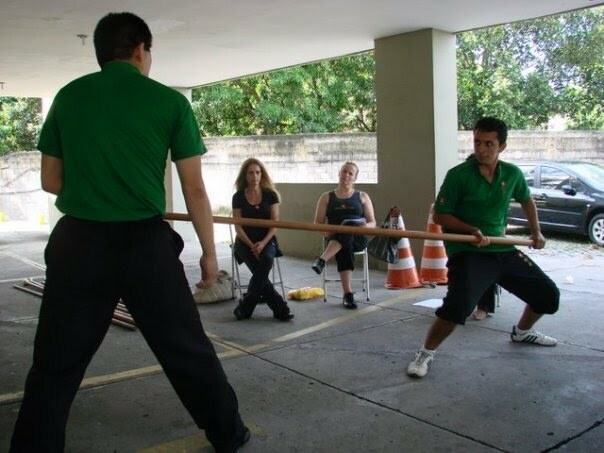 At one time, Rodrigo who had moved away from the KF Family, returned his practice with the opening of the MYVT Meier School at the invitation of Pedro Freire. 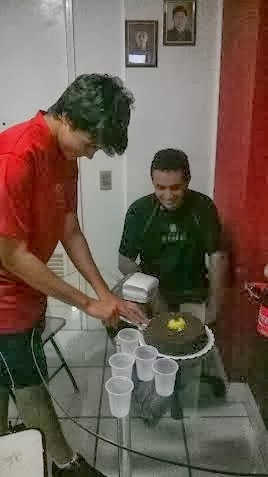 And at the night of the birthday of Pedro, Rodrigo who had moved away five days before again, called to say that not only he will continue in the Family, but to also suggest a lunch to celebrate the birthday of his friend and Si Dai Pedro Freire. Dois dias depois, lá estavam eles , lado a lado mais uma vez, mais velhos, porém ainda reunidos através da relação Kung Fu. Todos os presentes, tanto na Quarta quanto na Sexta, falaram algumas palavras sobre Pedro. Este tipo de momento, considero importante para que o irmão kung fu de alguma forma possa se sentir homenageado e ouvir a perspectiva dos demais a seu respeito. Two days later, there they were side by side again, older, but still gathered through the Kung Fu bonds. All the people there, both in Wednesday as on Friday, spoke a few words about Pedro. This kind of moment, I consider important for the kung fu brother somehow can feel honored and hear the perspective of others about him. Sobre Pedro, tanto o grupo de Quarta quando fizemos aquele bolinho no Mo Gun, quanto o grupo que estava presente no almoço de Sexta. Algo foi dito por todos: A maturidade de Pedro. About Pedro, both the group of Wednesday and the group that was present at lunchtime on Friday. Something was said by all: The maturity of Pedro. 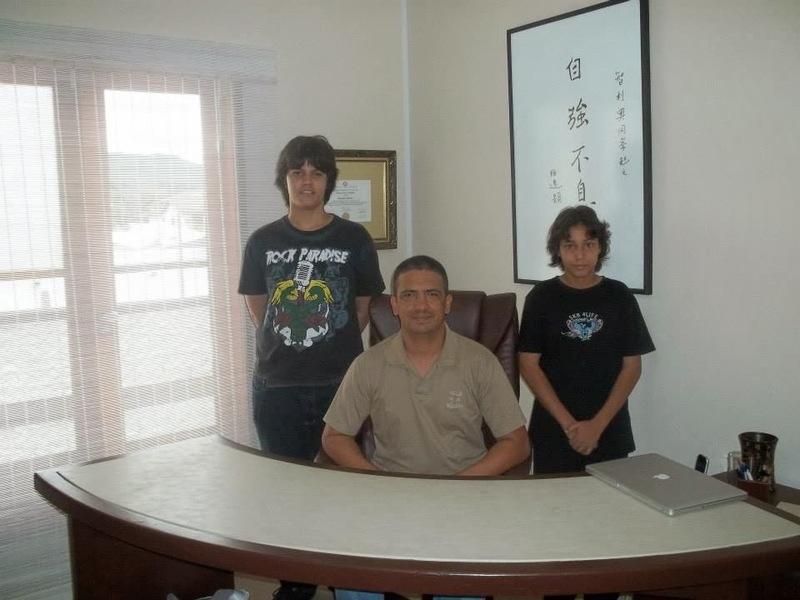 Por isso, para estes dois irmãos Kung Fu que entraram na Família Moy Jo Lei Ou juntos(foto), eu desejo muita sorte e que esse elo permaneça forte sempre. E para mim pessoalmente, é um privilegio acompanhar o crescimento deles, sabendo que eles também acompanham o meu. Therefore, for these two brothers who entered the Moy Jo Lei Ou Kung Fu Family together (photo), I wish much luck and that this bond remain strong forever. And for me personally, it is a privilege to follow the growth of them, knowing that they also follow mine. But we had one more b-day! O primeiro da esquerda para a direita é Guilherme Farias. 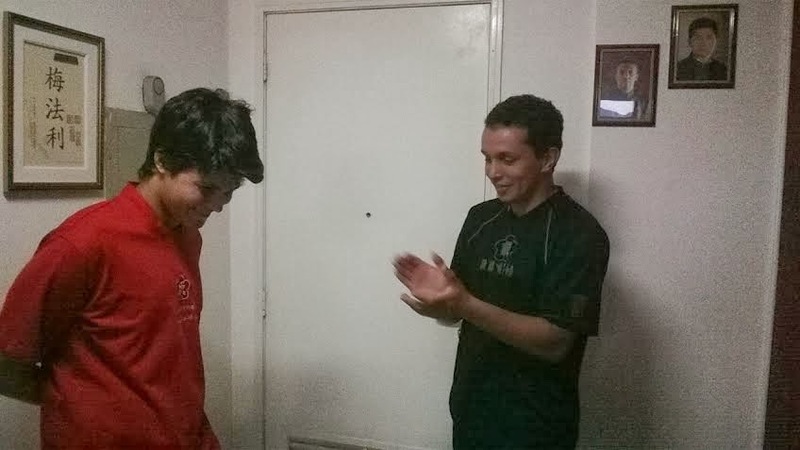 Ele começou na antiga escola de dança no bairro do Méier onde funcionamos por quase 4 anos. Guilherme começou sua prática depois de assistir a inúmeros workshops que ministrávamos naquela época. Na foto acima, Guilherme aparece com seus companheiros que praticavam com ele no mesmo local na época: Priscila Borges e Felipe Mury. Além deles, vemos Si Sok Ursula grávida de Rebeka que coordenava as sessões na época no Méier. The first from left to right is Guilherme Farias. He began at the old dance school in the neighborhood where Meier Ving Tsun was run for almost 4 years. 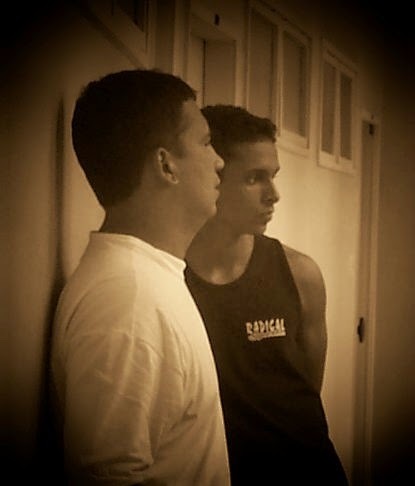 Guilherme began his practice after attending numerous workshops ministering at that time by our Family. In the photo above, Guilherme appears with his teammates who practiced with him in the same place at the time: Priscilla Borges and Felipe Mury. Besides them, we see Si Sok Ursula pregnant of Rebeka who coordinated the sessions at the time in Meier. 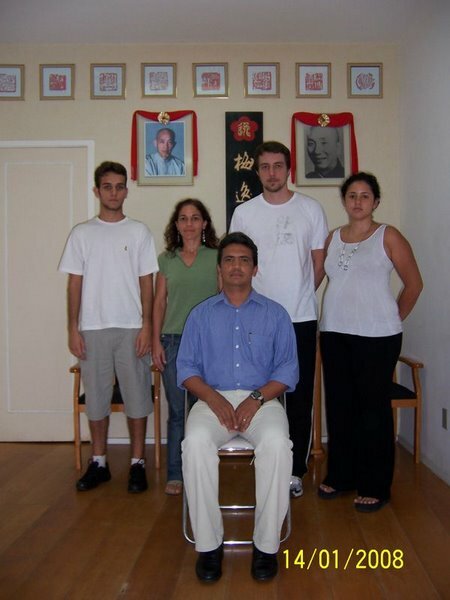 Quando Guilherme fez o Baai Si(foto) e recebeu o nome Kung Fu de "Moy Faat Lin", ele realmente provou que não estava brincando. Hoje sua pessoa tem papel fundamental na Família Moy Jo Lei Ou. E por atender a um chamado, a uma demanda da vida que precisava de um Si Hing com disponibilidade e comprometimento nesta Família Kung Fu, Guilherme muito cedo assumiu responsabilidades que outros como eu, com o mesmo tempo de prática que ele, nem sonhavam com tal coisa. 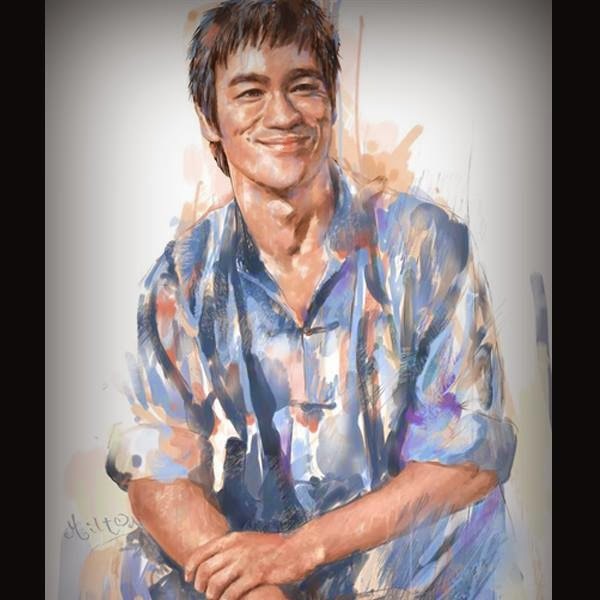 Também por isso, quero desejar um feliz aniversário publicamente a este rapaz, meu irmão kung fu que é um grande exemplo de lealdade entre um discípulo e um Si Fu. 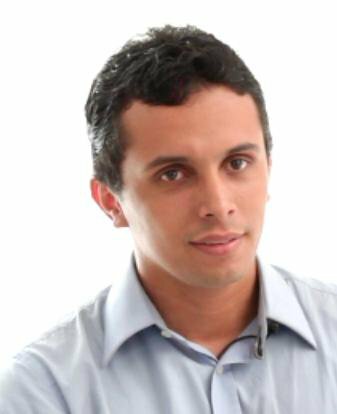 When Guilherme did Baai Si (photo) and was named "Moy Faat Lin" he really proved he was not joking around that day. Today he is a person who has a fundamental role in Moy Jo Lei Ou Family. 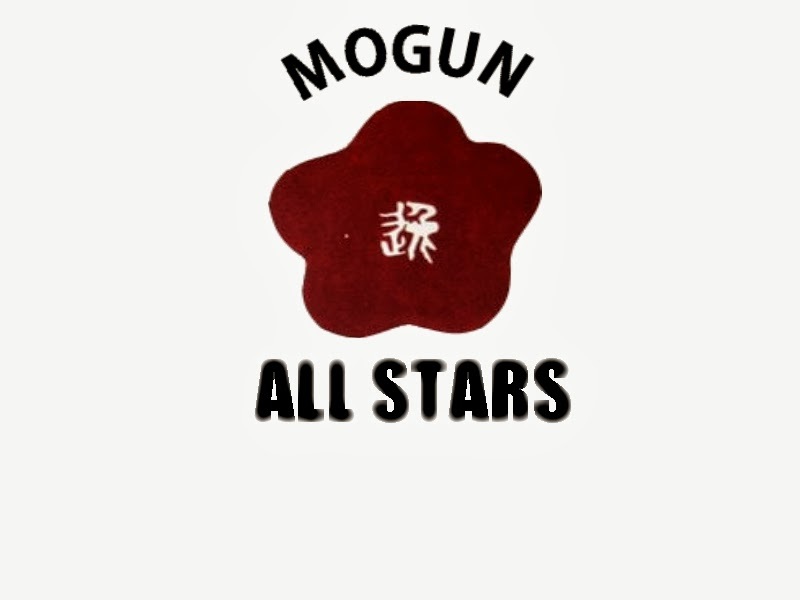 And answered a call, a demand of life that needed a Si Hing with availability and commitment in this Kung Fu Family, Guilherme early assumed responsibilities that others like me, with the same practice time of him, nor dreamed of such thing. This is also why I want to wish a happy birthday publicly to this boy, my kung fu brother which is a great example of loyalty between a disciple and Si Fu.